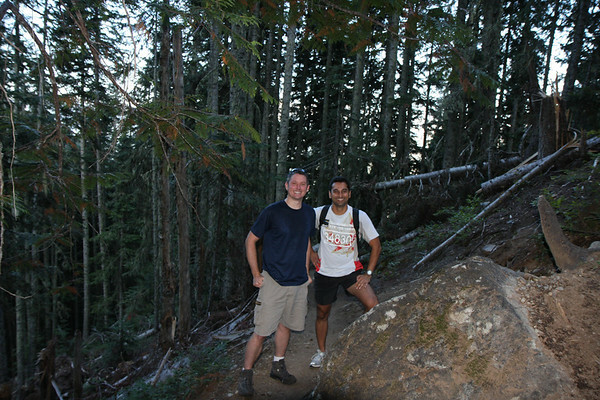 It was a great day, we met our objective and Neel summitted his first mountain. It's definitely gonna take awhile to recover from the pain of this hike though...definitely had my fill of scree, rock, and tree roots. The legs, ankles, knees, toes, and heels are not real happy with me at the moment but it was all worth it. Thanks for heading up Neel. - Our “mini-feast” at McDonalds - Quarter pounders, nuggets, lrge fries, pies, sundaes, multiple large drinks. We were even offered a free chocolate shake afterwards because we spent so much money. Just before the lake, I stopped to take this picture of our objective for the day. 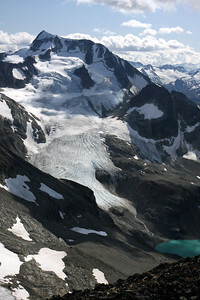 Mt Cook's false summit can be seen hanging in the clouds. Doesn't look like much from the picture, but it was a long haul up some nasty slopes to get the summit. We stopped for a quick break at Wedgemount Lake before heading up the route to Mt. Cook. 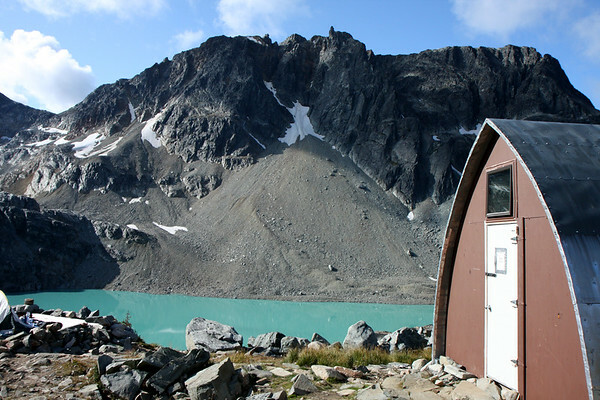 This is the little hut that sits just above the lake. Lots of hikers use this for an overnight stay or just for shelter from the wind or weather. From the lake, you first have to cross some steep heather meadows. The trail is faint at best, and we found ourselves climbing over some fairly steep terrain at times. After about 30 minutes of this, we arrived at the scree section of the hike (not fun). 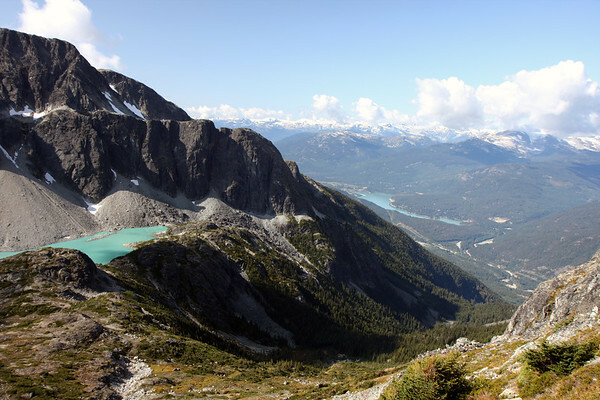 This picture was taken from the Heather slopes looking down at Wedgemount Lake (left) and further down into Whistler Valley where you can see Green Lake in the distance. The views only got better from here. We arrived at the ridge after a good hour of slogging through scree. 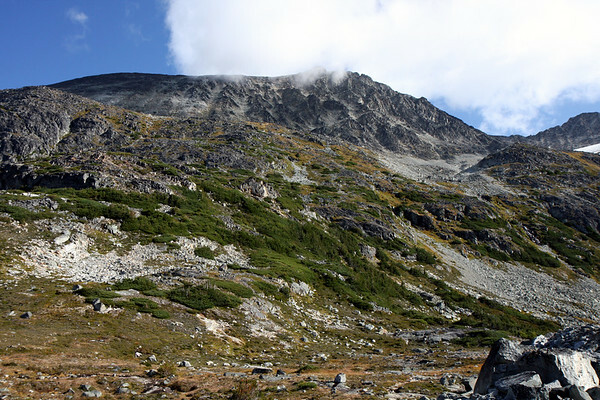 Scree is basically rock that just isn't meant to be walked on...it's either spraining your ankle, sliding out from under your foot, or rolling down the hill to hit your shin. 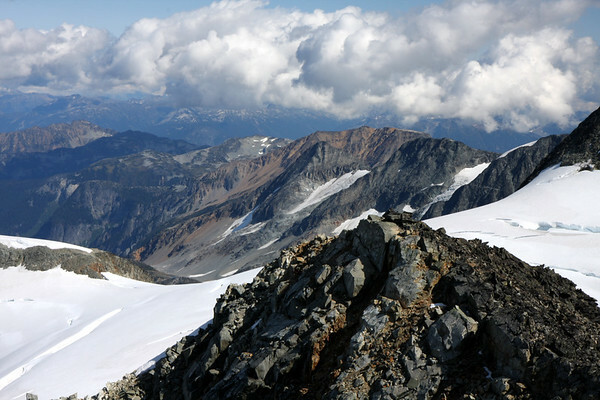 It was painful to get up, but once we did, we were rewarded with this view from the ridgeline. 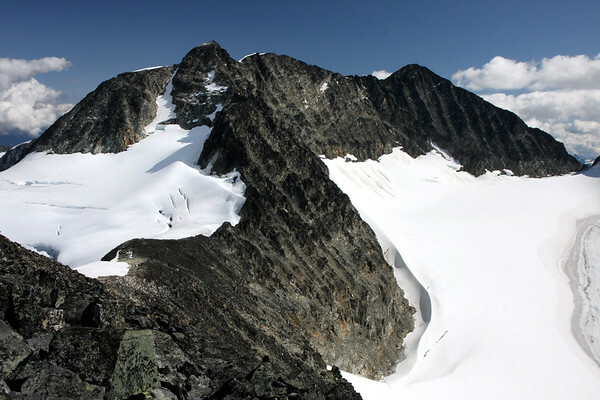 Taken from the West summit, the mountain in the distance is the South side of Mt. Currie. This is one of my favorite mountains in BC, and is the prominent mountain that is looms over the small town of Pemberton (just a half hour North of Whistler). Mt. 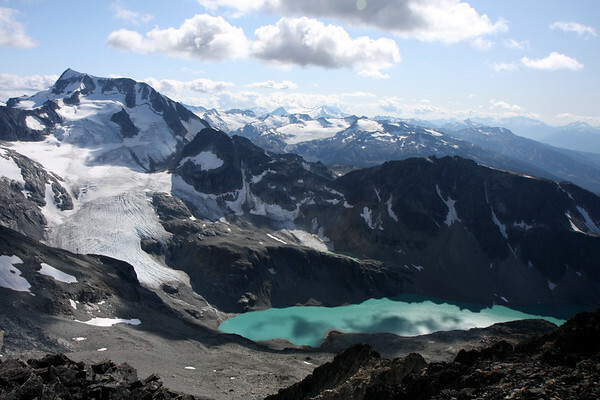 Moe on the right and unknown lake and unknown mountains in the distance. 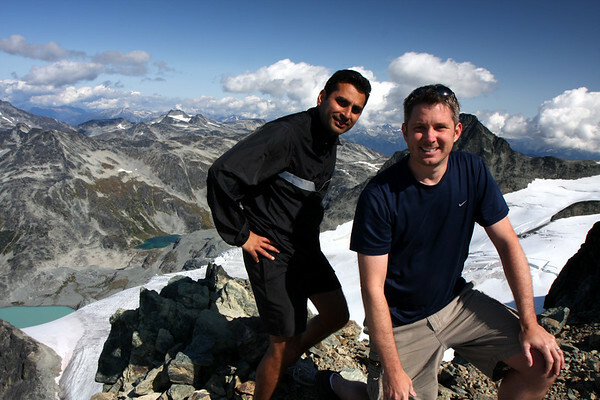 Neel and I at the West summit. 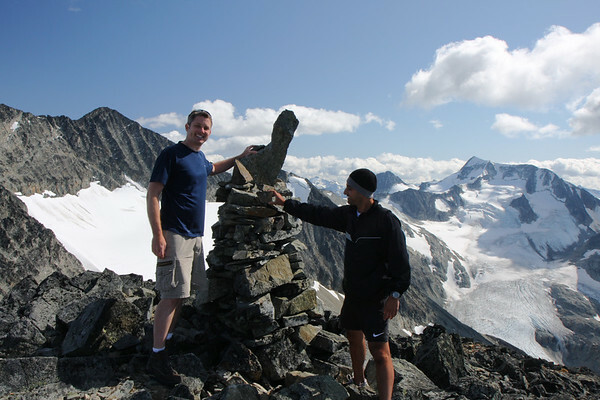 This was not the real summit however, and it took a bit of convincing Neel that we must continue on and up to get the real summit of Mt. Cook. Another picture looking North towards Mt. 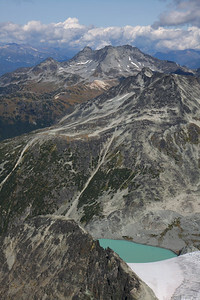 Moe (right) and Mt Currie (left in the distance). I never expected such infinite views from the ridgeline. Every direction I turned, we were surrounded by mountains. Not one flat area. 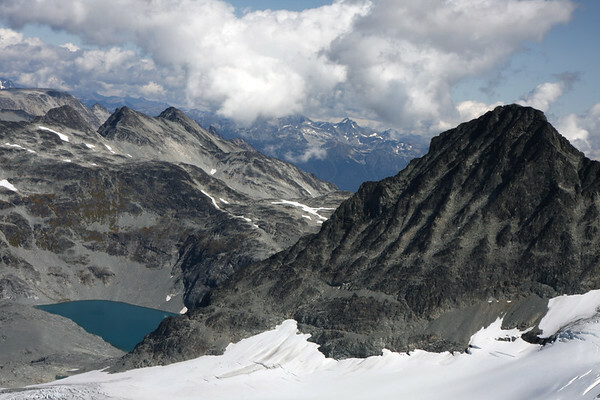 From the summit of Mt Cook, looking over at Wedge mountain, Wedge glacier and the very tip of Wedgemount Lake. 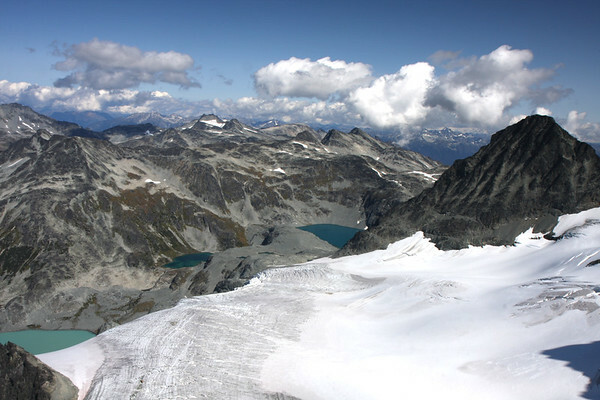 Amazing that only 10-15 years ago, the glacier extended all the way down to the lake. 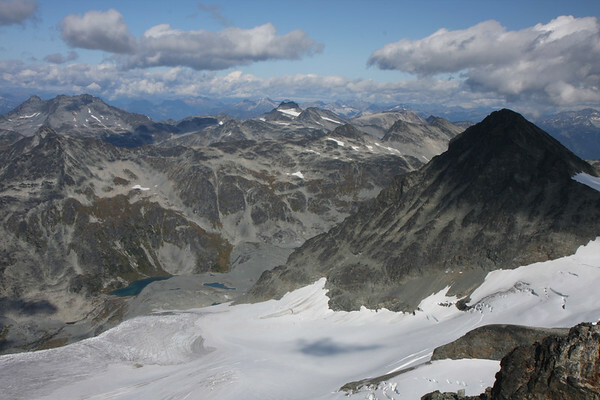 Looking over at Mt Weart and the Armchair glacier. 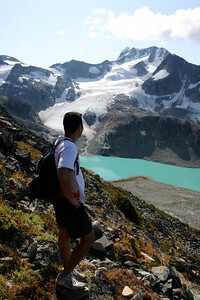 This peak is also accessible from Wedgemount Lake, however the hike is significantly longer, and a bit more challenging. Still worth attempting sometime soon...But it would definitely require an overnight stay. After 7.5 hours of going up, we finally made the true summit of Mt. Cook. We added a few rocks to the summit cairn and then took a well needed break. Neel ate his keishi bars (which tasted like crap) and spent his time throwing rocks and yelling to hear the endless echoes. I took lots of pictures and also made sure to call Oneea since we were running way late. Amazing to have cell phone service in what felt like such a remote place (especially since we didn't see another person on our hike up). We left the summit and downclimbed a small class 3 section to get back on the ridgeline. Near the edge, I took this picture and thought to myself..."We just spent 7.5 hrs climbing up and now we have to go all the way back. When we make the lake, we're half way home..Boy, it's gonna be a long, long way down."